When I run, I am reminded of who I am. The final miles of the Chicago Marathon, when the crowd was calling my name and I knew I was about to complete my first marathon. There is nothing more satisfying to me than helping others achieve their goals and dreams! Enjoy this moment; you’ve earned it! I was obese until I was 30 years old; through diet, exercise, and a radical change in the way I think and view my life, and believe that I am a living example that your past does not define you! 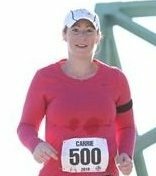 I volunteer at local races to offer support to runners (and give them candy and chips at mile 20!) I am also active with church activities.